On the evening of 5 July 2018, Singapore’s property market got a shock when the Government introduced a fresh (and unexpected) round of cooling measures. This comes off the back of multiple rounds of cooling measure over the past nine years, the last of which was introduced in June 2013, when the Total Debt Servicing Ratio (TDSR) was introduced. Today, we look at how would the latest measures impact on Singapore property market. 1) Future price growth may not grow as much as analyst predicted in the early of this year. Whether the price will continue to head north or go side-lines, only time will tell. However, it’s un-likely to have major price correction purely because of the newly implemented cooling measures. 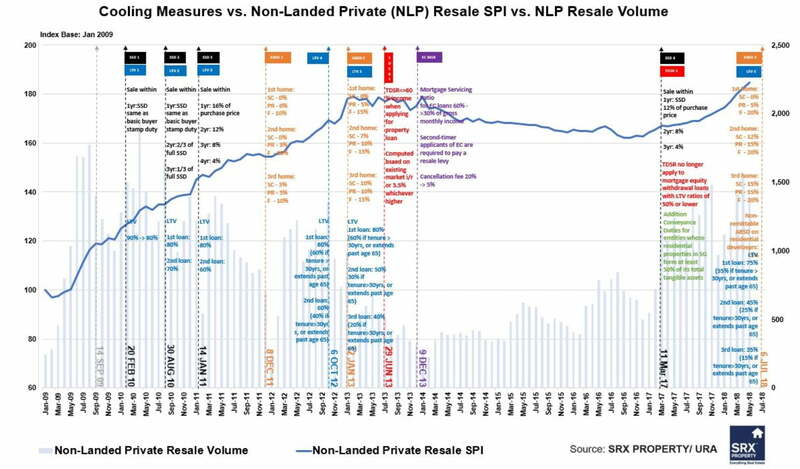 Singapore government has repeatedly stressed that it has no intention to crash the property market, but needs to ensure price increment in line with economic fundamentals and not resulting of any speculative bubble. 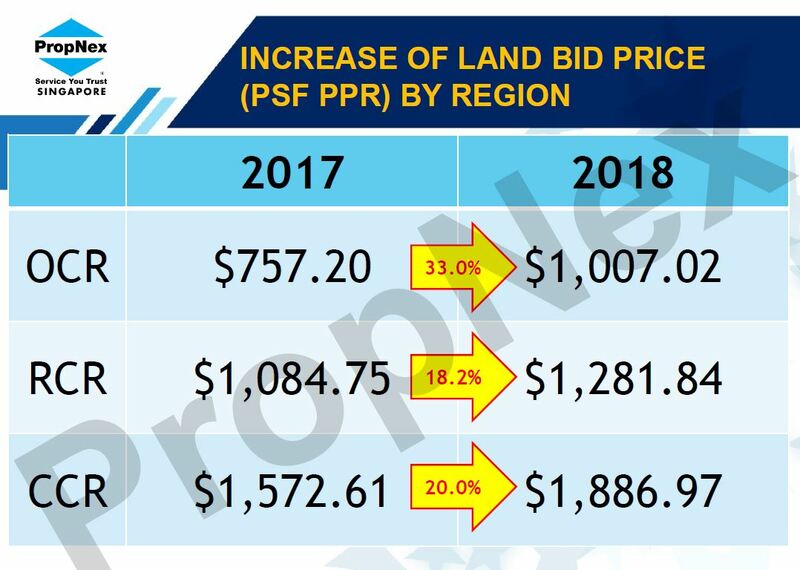 Developer may become price sensitive in their new launches, however the price may still hold quite tight due to fast accelerated land cost in the past one year. (refer to above chart). 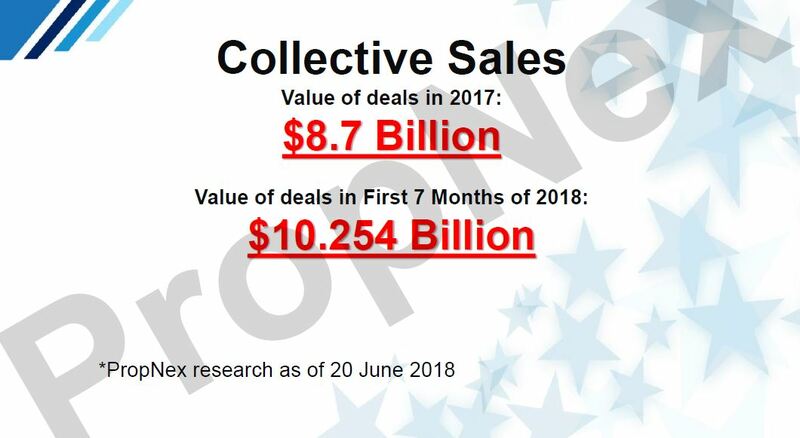 Demand for the next 2 years might be well supported by the hot money released from the enbloc deals to the market, $19 billion liquid equity need to find place to park. (refer to below chart) Domestically, Singaporeans tend to have greater faith putting their money in real estate than in other asset classes like equities or bonds. Imagine if half of the money were to flow back into the property market with average 50% loan-to-value ratio, which is $19 billion worth of property value. This amount can easily consume 19,000 units of condos with average value of $1,000,000. e agent. 2) En-bloc fever will cool down. The hardest hit group with the latest ABSD are the developers. The rate was increased from 15% prior to 5th July to now 30%. Developers will be more cautious in bidding for en-bloc site as the cost of acquiring land (especially the mega site) has effectively increased and furthermore, developers now face higher risks if they are unable to sell out all the units with five years of acquiring the land. 3) Cooling measures are here to stay. Investors who have been waiting patiently on the sidelines since year 2013 hoping for relax of cooling measures would finally wake up and realize that could be just their wishful thinking. Cooling measures might be here to stay as a permanent tax feature and it could even get more drastic. 4) 1st Time home buyers are the lucky group. 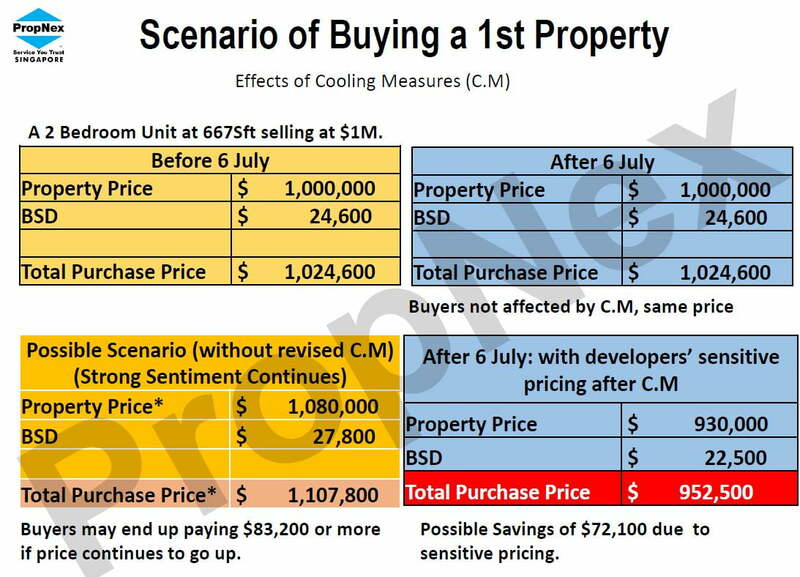 The only group generally not affected by the latest round of cooling measure are the Singaporean and PR 1st time buyers. This is a good time for them to come out and hunt for some good deals. As developers and resale owners will become more realistic in pricing their units. (refer to below comparison) The only effect is that they need prepare 5% more upfront capital as loan-to-value now dropped from 80% to 75%. People with not enough capital may turn to new launches, as the payment goes with construction stage and they have more time (9-12 month) to save up the extra amount. Homebuyers will have a wide list of options to choose from with a robust pipeline including Treasure at Tampines, Riverfront Residences, Parc Esta, Stirling Residences, The Tapestry, Jadescape, Parc Colonial and Whistler Grand. 5) De-coupling of property ownership or re-structuring of property (sell one buy two under individual names) will become norm. Since 2013 when TDSR and ABSD came into effect, we have seen a fair number of clients doing de-couple of property ownership by removing one party from the existing property and free up the other party to buy another property as 1st time owner. Typically, such de-coupling or part-purchase could cost you below $30,000 (if current property value below 1.5M) including the legal fees and stamp duties you need to pay for transferring the half share. Another more straight forward way is to cash out from existing property and re-invest into 2 properties under individual names. 6) There could be mixed effect for HDB resale market. People who has not enough cash (due to lower loan-to-value) to buy a condo may turn to HDB resale market, which increases the demand. While, at the same time, more HDB owners who have intention to keep their HDB and invest another condo initially, may now have to consider sell away their HDB to save on ABSD, which increase the HDB supply in the market. 7) Rental market may improve. As some buyers may hold horses to watch market while in the meantime renting first. And there might be more foreigners willing to rent than before considering the extra 5% ABSD to buy a home now. 8) The Commercial or Industrial market could see renewed interest as there’s no ABSD for this segment yet. Especially for those market yet to impose ABSD, like Vietnam, Cambodia, Malaysia, Thailand and Japan, etc.. And because of the low entry price for these countries, the ABSD amount for Singapore Condo ($150-$200k) alone might be able to fully paid the properties for most of these countries. However, buyers considering to invest into overseas market should exercise due diligence before investing, as it involves whole lots of risks that you may not be aware in a country that you are not familiar with. Above are just my personal views, investors should have your own judgement based on facts and figures you can obtain from the research.